I didn’t have the most linear experience deciding where I wanted to go to college. Rewind to 3 years ago, I was absolutely set on going to a private school in Colorado so that I could be on their figure skating team. I was so certain of my college plans that when I found out that I was accepted to UC Davis, I shrugged off the accomplishment, not giving it much thought, while my friends around me who also got their acceptances were crying from happiness and celebrating. So what happened? Obviously I’m not at a private school in Colorado. What initially changed my college trajectory was my family’s and my realization that an out-of-state, private school was not financially plausible. So, suddenly, with only a few weeks before I had to commit to a school, I needed to find a plan B. At first, I was crushed and didn’t even want to look at other options, but finally, after moping around for a few days, I decided to seriously consider my other options. My mom and I scheduled tours at four universities around California. First up was UC Berkeley. Tempted by the university’s prestige, I really wanted to love it there. But, it just didn’t feel quite right. I couldn’t see myself going there. As cliche as it sounds, it just didn’t click. 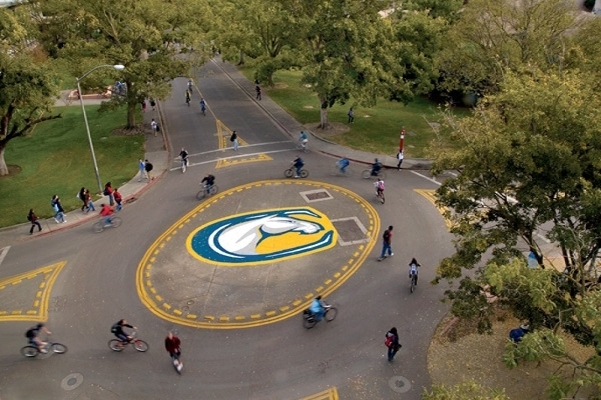 So, even more discouraged at that point, I moved on to the next school – our very own UC Davis. I unfortunately don’t remember my tour guide’s name, but I do remember their avid and genuine enthusiasm for the school. And as we walked throughout campus, I was struck by how friendly everyone was. Students biking past yelled “Go UC Davis!” and various other exclamations. (It probably helped that I didn’t tour during midterms or finals.) It seemed as though, even though UC Davis was a large university, it was still a community – an observation that I still stand by today. Having grown up in a town of 7,000 people, that feeling of community and familiarity was and is very comforting to me. Hearing from the tour guide about the various resources on campus also added to that feeling of community. It was apparent that UC Davis took student support very seriously. My interest peaked when I heard about all the internship and research opportunities. Previously, I had pictured going to a UC like being a tiny fish in a huge pond, where opportunities like internships were elusive and hard to come by. Hearing that there were centers like the Internship and Career Center was both surprising and exciting. Incredibly relieved that I had liked the campus, I spent the hour and a half drive home glued to my phone, doing research about the different academic programs at UC Davis. All I knew at this point in my life was that I wanted to major in something science-y, but I knew nothing beyond that. Reading about majors like Neurobiology, Physiology, and Behavior, Biomedical Engineering, and Genetics, among many others, made me realize that going to a big university like UCD would give me so many more options than if I went to a small private school. As a very indecisive, stereotypical Pisces, having so many options to choose from was a huge factor in my ultimate decision to attend Davis. So, after realizing that I could easily see myself biking around the campus for the next four years and learning about the different academic programs offered, my mind was basically made up. I ended up cancelling my tours at the last two schools I was considering attending and submitted my intent to register that next week. And, here I am, 4 years later, incredibly grateful for my winding journey that led me to become an Aggie.